Last week it snowed in North Carolina. I’m not talking about a light dusting of snowflakes or a thin sleek sheet of black ice, I’m talking five solid inches of pure snow, another inch of hard freezing rain to encase the damaging wintry precipitation. For Triangle residents it meant power outages and abandoned cars. For Chapel Hill students it meant two and a half days of cancelled classes. However, the larger story was about a little basketball game scheduled for February 12th, between two powerhouse schools located a mere eight miles apart. Unlike some of my peers, I didn’t grow up with the UNC-Duke rivalry. I wasn’t even a college basketball fan until I turned ten or eleven. As a child the sight of college basketball only meant the worst month of the year had arrived, the heat of March Madness and tax season leaving me woefully abandoned and self-sentenced to play with my Barbie dolls until it was all over. Somehow, over the years I was converted, and when I received the opportunity to film the rivalry game this year I was beyond excited. My freshman year I experienced the heartbreak of watching Austin Rivers crush our Beat Duke dreams (I refuse to link to that horrible moment, you may Google it if you wish) and sophomore year I got a ticket in the nosebleeds while Duke creamed us by 20+ points. But this year, something was different. The faith was restored, the hope was strong as a fresh bonfire, and something in the atmosphere was not the same. Last night, eight days after the original schedule date, the rivalry continued. We played an epic game, the crowd was louder than any I had ever heard. The floor shook. I sat courtside with my camera, worried about missing any important moments. It was all important. It all meant something. And as the final seconds expired I stood up, lens locked on the court, and stood as a mad rush of students ran past me, pure pandemonium essentially flooding the dome. 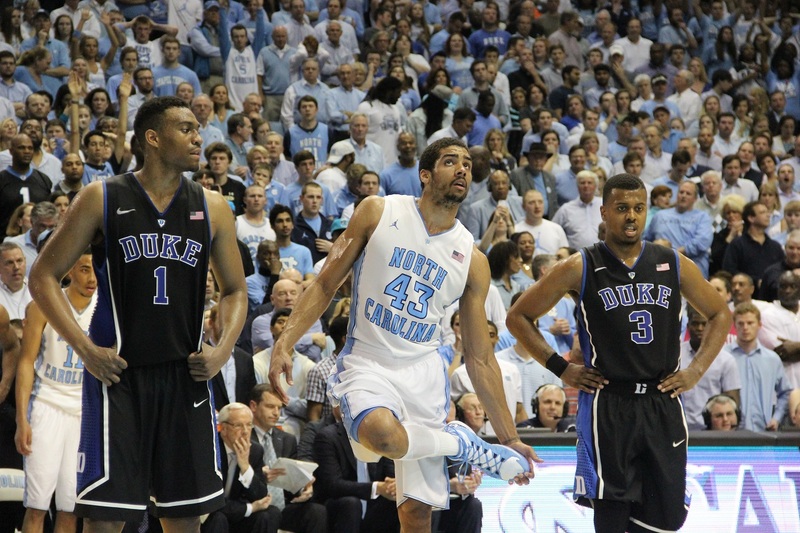 UNC defeated Duke by eight points for its eighth straight win. Everything about it was fate. And everything about winning and rushing Franklin was better than I expected. For one night everyone was a connected entity with a singular emotion and most of all I felt pride. I felt the intensity of this culture of blue and the enormity of the moment. We were one identity: Tar Heels. And we believed in that identity with everything we had. Happiness is often discounted for being an overused word, but it would not be wrong to say we were all completely happy. For our team, our school, ourselves and everything that win represented. Like all sports, Thursday night told us what was possible, it told us not to give up, it told us to believe, it told us we (the fans) had an impact on the game, and it said we deserved to celebrate. I rushed Franklin with strangers who high-fived and hugged me like relatives. I found friends who embraced me with a jubilance we didn’t know was possible. Chapel Thrill was ignited. I saw people jump fires and climb light poles in the name of love and it was beautiful. It was beautiful that something so simple as a game could bring everyone together. It was beautiful to know that in a place where each of us have so many differences, we shared something in common. I would be lying if I said I didn’t tear up during the end of the game and being on Franklin, seeing something that emotional and knowing you would never forget it. Coming back to my room the next morning was weird. The street was clean, void of any evidence of that night, buses running normal routes, people walking to work and class. Something had been erased from the surface but its mark was still imprinted in the asphalt, in the brick, the town knew what had happened, and so did we. The fog and cloudiness in the air made it all seem like a dream. My lost sense of time left me warped in a surreal world where childhood dreams come true but no, this wasn’t a fantasy; it was real. It happened. And we were witnesses.